Remembering my grandmother again as I talk about the 'Chyawanprash' she used to make every winter. While we used to hate the commercial Chyawanprash manufactured and marketed by a reputed Ayurvedic pharmacy, we would lap up the jam like light coloured Chyawanprash made by dadi. One heaped spoonful of this Chyawanprash with milk or even without milk used to be a winter guard against all worldly trouble. Well, being sick was the only worldly trouble we knew at that time. I started making this Chyawanprash when I discovered that Arvind was very prone to catching cold and flu during winters and a jar or two was always shared with friends who needed it for their kids' winter ailments. I always got good reviews of this Chyawanprash even from kids but somehow we both lost interest in this and stared enjoying the savoury Amla chutney, another recipe of my grandmother with almost similar health benefits. This amla pickle also gets consumed every winter. I feel blessed to have inherited this legacy of my grandmother. Now when I make this Chyawanprash I call it spiced Amla jam as I don't add ghee to it. The original recipe used ghee and a lot more spices and herbs. 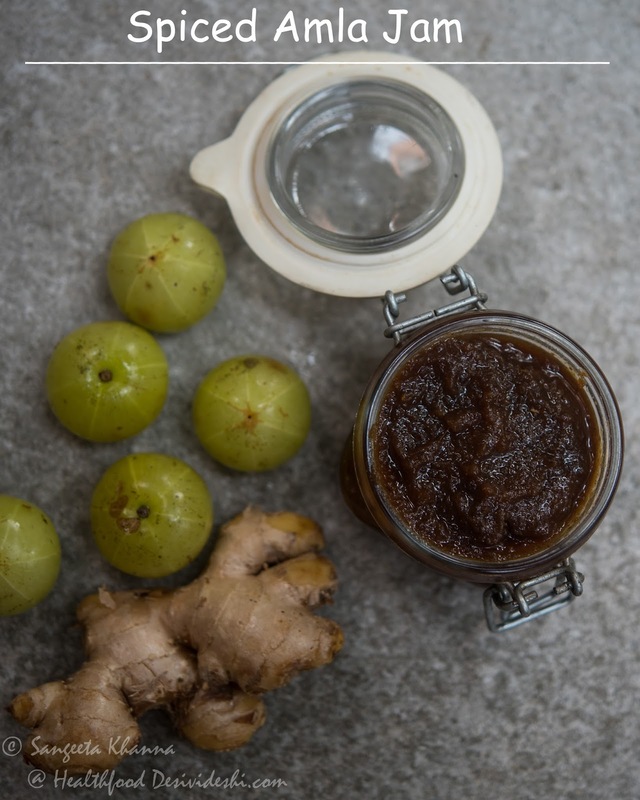 So it is better calling it a spiced Amla jam, it makes a great spread on toast or crisp paratha. We just eat a spoonful of this jam with our breakfast these days. Recently I made 50 jars of this spiced amla jam for Eat with India, an initiative that encourages people to cook and eat regional Indian food. They included this jam and my kanji in their Diwali gift hamper. This was the first time I made such a large quantity of jam and kanji, 50 jars each, consuming about 15 kilos of amla and 8 kilos of beetroots. Cook amla in pressure cooker with 500 ml water till it becomes very soft and disintegrates. If cooking in an open pan you may need more water and more time. In pressure cooker it takes 20 minutes after the first whistle. Mash the amla while still hot and remove all seeds. Make a paste in mixie if you want a really smooth jam. I just mashed it nicely. Note that it doesn't mash well when cold. Make a paste of the ginger and mix with the amla mash. Make a fine powder of all the spices together. Mix everything in a thick base stock pot or use the pressure cooker pan (without the lid) to cook the jam. Keep stirring and cook till the jam reduces to a thick consistency. It starts getting a light shine when cooked well. Fill in the jars while hot and screw the lid tightly. You can sterilise the closed jars by immersing them in boiling water for at least 10 minutes. This ensures the shelf life to be a year. Otherwise just refrigerate the jam. This spiced amla jam or Chyawanprash helps improve immunity and many minor health issues like respiratory tract infections and joint pains. But the taste is so good that you can make it just for the taste too. Do not worry about the sugar content as this chyawanprash is so rich in anti oxidants and minerals that it is worth having the sugar with it. Also, since it is consumed in small amount (about 10-15 gm in one serving) the sugar consumption is not much. You can use good quality molasses instead of jaggery but do not replace jaggery with sugar in this chyawanprash recipe. There is no need to use honey as some recipe suggest. 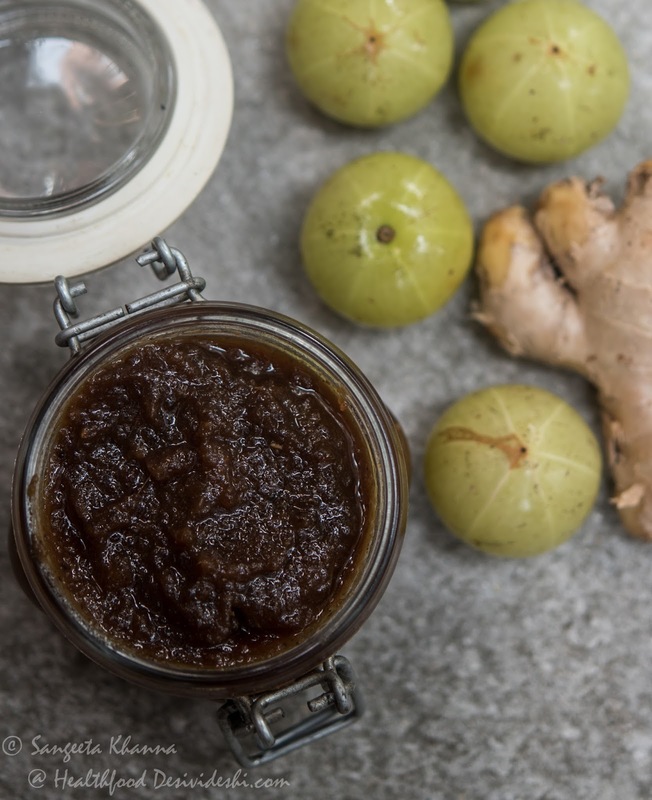 Please make it this winter and see how everyone starts loving this spiced amla jam, don't call it Chyawanprash if your family has been hating the commercial Chyawanprash already. Spiced amla jam works better on the dining table. But make sure you don't take generous helpings of this spiced jam as it can be too 'drying' for the system. Having a spoonful of this with full fat milk everyday is the traditional way and I follow that. The recipe that you have shared seems very healthy and is a great alternative to Chyawanprash normally available in markets. 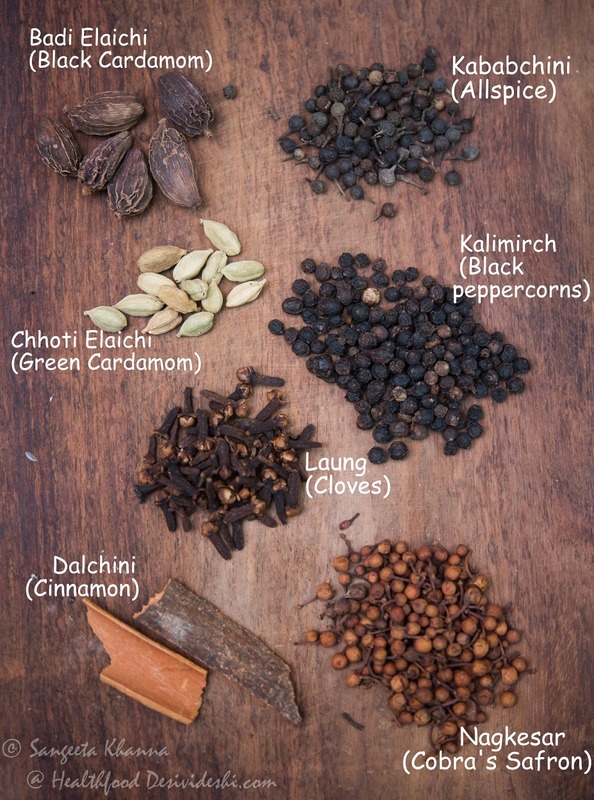 I am interested in making this for my family, however, can you please let me know where I can find these spices in Gurgaon. Hi Fariha, I am not too familiar with Gurgaon markets but in Delhi you get all the spices in Khari Baoli. Try ordering online if you don't get anywhere or just exclude the spices that you don't get, the spiced amla jam will still be great. Gurugram is also big city and go to old kirana stores ,pansari shop 80 % iteam you will get it. Please show this list as shown in this recipe. Can u please give me the original recipe with ghee and other spices..... have been searching and would love to make it. Thanks much. Padma. From Pune. Superb recipe to consume the superfood amla.